Knee Archives - Page 2 of 4 - Dr. Jeff Stickney, M.D. Although osteoarthritis is one of the most common chronic joint conditions, few nonsurgical options have shown long-term benefits. Impacting almost 27 million Americans, the disease causes pain, swelling, and mobility issues as the cartilage between joints wears down. Joint replacement surgery can provide relief once the disease has significantly progressed, but nonsurgical alternatives have only had short-term benefits. Now, a new study published in The Journal of Arthroscopic and Related Surgery suggests that Platelet-Rich Plasma (PRP) injections could combat pain and improve joint functioning in the knee. In the past, nonsurgical treatments have included using anti-inflammatory drugs and corticosteroid and hyaluronic acid (HA) injections. While they ease discomfort, research hasn’t found that the conditions are improved over a longer length of time, necessitating total knee replacement surgery. PRP, however, might offer a new solution. PRP is blood plasma infused with platelets and contains several different growth factors. It’s been used to help alleviate pain from damaged muscles, ligaments, tendons, and joints by healing damaged cells and promote formation of cartilage repair tissue. Until now, no tests about its efficacy have been conclusive, partly due to small sample sizes. To make a more definitive claim, researchers from The First Affiliated Hospital of Chongqing Medical University conducted 10 randomized controlled trails with 1,069 patients. 562 patients received PRP injections to their knees, 429 received HA injections, and 78 received saline injections. Studies had three month, six month, and 12 month follow-ups. Although at six months, relevant studies showed no difference in pain or function scores, at one year, the researchers found that PRP was significantly more effective than HA at relieving pain and improving function. Researchers were concerned that the proinflammatory substances PRP releases could be detrimental to tissues. However, no tissue damage was reported at either the six or 12 month follow-up and there were no differences in adverse effects between PRP and HA. More research will be needed before this can be confirmed. Overall, these results show that PRP could be a viable nonsurgical option for patients with OA, helping regenerate tissue and stimulate HA production over a longer period of time. Is knee pain impacting your quality of life? Dr. Stickney, a Kirkland orthopedic surgeon specializing in procedures including total knee replacement, can help you determine what surgical or non-surgical options are best for you. Contact his office today to learn more. One of the most common myths around running is the toll it can take on your knees as you get older. 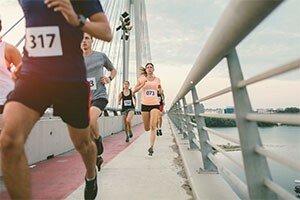 Both runner and non-runners generally promote the claim that exercise causes the cartilage around your joints to deteriorate, leading to arthritis and possibly necessitating treatment by an orthopedic surgeon. However, recent research has shown that it can actually be beneficial for your body and joints, warding off arthritis in the future. Researchers from Brigham Young University have found that running changes the joint’s biochemical environment so it functions better, longer. Various studies have followed runners throughout lengthy periods of time to determine that they are less likely to develop osteoarthritis than their non-runner peers, but until now, why this is has only been conjecture. Experts speculated this was due to a lower body mass putting less strain on the knees, but little work had been done to isolate the impacts of running on joint health. The team at BYU studied fifteen male and female volunteers, all of whom were runners, under 30, and had no history of arthritis. The researchers collected a small amount of blood and synovial fluid, a fluid that lubricates joints, from each volunteer — the healthier the joint, the lower the amount of synovial fluid present. They also looked at specific substances within the knee, including cartilage oligomeric matrix protein (COMP), usually a marker of arthritis and present in higher levels in unhealthy knees, and other inflammatory molecules. The volunteers ran for 30 minutes and sat for the same period, each session occurring on separate days. When the volunteers ran, higher COMP levels were observed in the blood than the synovial fluid, indicating that exercise pushed the substance into their blood and out of the joint. However, when sitting for only 30 minutes, the amount of COMP and inflammatory molecules was raised. This suggests that even half an hour of exercise alters the knee, lowering inflammation and substances that indicate arthritis. However, sitting for that same amount of time also changes the knee, and not for the better. It could make the joints biochemically more vulnerable to diseases in the future. The researchers, who published their findings in the European Journal of Applied Physiology, hope to study older or injured runners to see if their knees have fundamental differences from young, healthy joints, and how running might impact them. 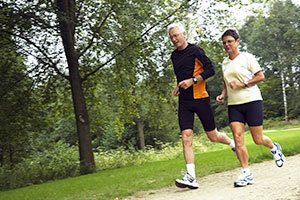 Is joint pain impacting your ability to exercise? Interested in learning more about total knee replacement or non-surgical alternatives? 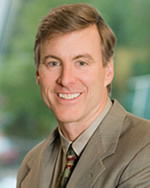 Contact Dr. Stickney, a Kirkland orthopedic surgeon, today. Knee osteoarthritis is a progressive degenerative condition. Up until recently, all treatments have been directed at ameliorating its symptoms, with no hope of stopping disease progression. However, recent trials using Platelet-Rich Plasma (PRP) to treat the disease, rather than just the symptoms, have had encouraging results. PRP is concentrated plasma from your own blood that has been separated to include platelets, small blood cells that are loaded with growth factors responsible for healing cells and that help form clots so your body can repair any damage. Many of these growth factors have been shown to promote cartilage regeneration. Although PRP has been used since 1987 to help with cell regeneration, using it to stimulate cartilage renewal is fairly new. The treatment entails drawing blood and injecting the PRP into the knee. Two recent scientific papers reported decreased pain and improved function after PRP injections. In 2011, the Journal of Arthroscopy reported on the comparative results of injecting knees with PRP versus viscosupplementation with Hyaluronic acid, a procedure that injects a lubricating fluid into the joint. At the six-month follow-up, the PRP group had less pain. A second study in the American Journal of Sports Medicine in 2016 reported on the comparative results of injecting PRP versus saline, which was used as a control. The results of this study showed dramatic improvement at six months in both pain and function for the PRP group. There is much more to learn about PRP injections, and a lot of research is ongoing in this field. This data is very encouraging. PRP is readily available, easily processed, safe, and one of the only proven regenerative treatments for early arthritis of the knee. If you’re suffering from arthritis or are interested in learning more about PRP as a treatment option, contact Dr. Stickney, a Kirkland orthopedic surgeon.